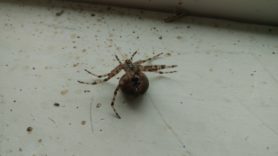 I would like to know if you can help me identify a spider I found hanging from my ceiling fan in my bedroom. I live in South Africa in a town called Tzaneen. It falls under the province of Limpopo. 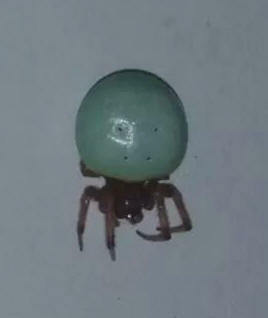 The spider is a small spider with a huge blue greenish round abdomen. 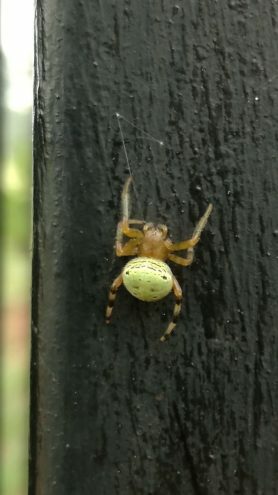 With four dots on the top part of the abdomen. I have more photos but you can only load one per time. 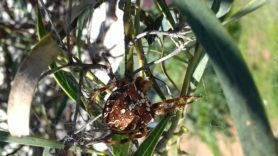 I’m not familiar with the species in your region but can at least tell you this is an Orb-weaver (family Araneidae). Not sure but looks plausible. 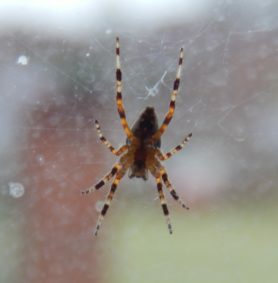 Thanks guys I think that it might be an araneus apricus. I had a look on the web and they look pretty similar to the one I saw. The spider in my case just had a more blue green turquoise colour. I appreciate the help. Glad to to know what type of spider I was sharing my bedroom with.